State Dept., 1873, $2 green & black, neat "Washington D.C." oval cancel, wide margins, rich bold colors, Very Fine; with 2006 and 2014 P.F. certificates. A RARE SOUND AND ATTRACTIVE USED EXAMPLE OF THE $2 STATE DEPARTMENT HIGH VALUE. The $2 State Department issue in used condition is one of the most difficult issue to obtain not only in sound condition, but with a neat unobtrusive cancellation. The P.S.E. to date has only graded one example above a 50 at the grade of 75. 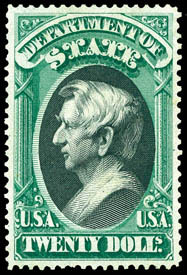 State Dept., 1873, $20 green & black, large part o.g., perfect centering amid wonderful large evenly balanced margins all around, both colors unusually rich and intense with a remarkable detailed impression, a Superb gem, in our opinion, a woefully undergraded stamp; with 2014 P.S.E. 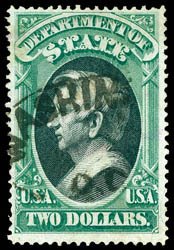 Graded certificate (XF 90, SMQ $11,500). WITHOUT QUESTION - ONE OF THE FINEST EXAMPLES OF THE $20 STATE DEPARTMENT ISSUES IN EXISTENCE.